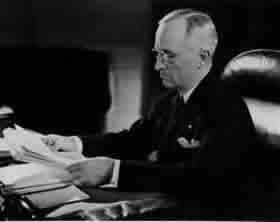 President Harry S. Truman learned most of what he knew about the Cold War on the job, starting with his meeting with Stalin at Potsdam outside Berlin in July, 1945. By 1947 he, like many Americans, saw Communism as a threat to international peace and stability that had to be contained. Here is the speech to Congress in which he outlined his "containment doctrine." The gravity of the situation which confronts the world today necessitates my appearance before a joint session of the Congress. The foreign policy and the national security of this country are involved. One aspect of the present situation, which I wish to present to you at this time for your consideration and decision, concerns Greece and Turkey. The very existence of the Greek state is today threatened by the terrorist activities of several thousand armed men, led by Communists, who defy the Government's authority at a number of points, particularly along the northern boundaries. A commission appointed by the United Nations Security Council is at present investigating disturbed conditions in Northern Greece and alleged border violations along the frontiers between Greece on the one hand and Albania, Bulgaria and Yugoslavia on the other. Meanwhile, the Greek Government is unable to cope with the situation. The Greek Army is small and poorly equipped. It needs supplies and equipment if it is to restore the authority to the Government throughout Greek territory. We have considered how the United Nations might assist in this crisis, But the situation is an urgent one requiring immediate action, and the United Nations and its related organizations are not in a position to extend help of the kind that is required. . . . Since the war Turkey has sought additional financial assistance from Great Britain and the United States for the purpose of effecting the modernization necessary for the maintenance of its national integrity. That integrity is essential to the preservation of order in the Middle East. To ensure the peaceful development of nations, free from coercion, the United States has taken a leading part in establishing the United Nations. The United Nations is designed to make possible lasting freedom and independence for all its members. We shall not realize our objectives, however, unless we are willing to help free peoples to maintain their free institutions and their national integrity against aggressive movements that seek to impose on them totalitarian regimes. This is no more than a frank recognition that totalitarian regimes imposed on free peoples, by direct or indirect aggression, undermine the foundations of international peace and hence the security of the United States. The peoples of a number of countries of the world have recently had totalitarian regimes forced upon them against their will. The Government of the United States has made frequent protests against coercion and intimidation, in violation of the Yalta Agreement, in Poland, Rumania and Bulgaria. I must also state that in a number of other countries there have been similar developments. The second way of life is based upon the will of the minority forcibly imposed upon the majority. It relies upon terror and oppression, a controlled press and radio, fixed elections, and the suppression of personal freedoms. It is necessary only to glance at a map to realize that the survival and integrity of the Greek nation are of grave importance in a much wider situation. If Greece should fall under the control of an armed minority, the effect-upon its neighbor, Turkey, would be immediate and serious. Confusion and disorder might well spread throughout the entire Middle East. Should we fail to aid Greece and Turkey in this fateful hour, the effect will be far reaching to the west as well as to the east. We must take immediate and resolute action. I therefore ask the Congress to provide authority for assistance to Greece and Turkey in the amount of $400,000,000 for the period ending June 30, 1948. Finally, I ask that the Congress provide authority which will permit the speediest and most effective use, in terms of needed commodities, supplies, and equipment, of such funds as may be authorized. . . . The seeds of totalitarian regimes are nurtured by misery and want. They spread and grow in the evil soil of poverty and strife. They reach their full growth when the hope of a people for a better life has died. We must keep that hope alive. The free peoples of the world look to us for support in maintaining their freedoms. If we falter in our leadership, we may endanger the peace of the world-and we shall surely endanger the welfare of this nation.